I weep for South Africa; I weep for Africa. I have not been at peace with my soul since I heard the fresh bout of xenophobic violence and killings in South Africa. 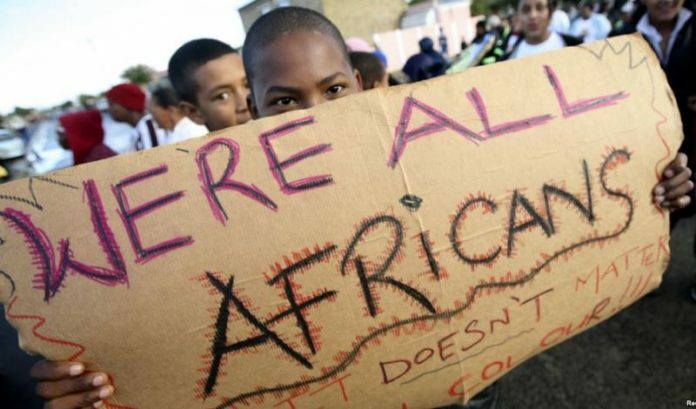 The more than three decades xenophobic crises in South Africa, targeting immigrants erupted again on March 15, 2019 at Sydenham, Jadhu Place and Overport areas of Durban district of South Africa. International Media reports revealed chilling and gory details of the latest crisis which have continued to shock the world. I was disarmed and startled to know nearly 100 “aggrieved” South African youths armed to the teeth, violently descended on businesses owned by foreign nationals. In the ensuing inferno, at least, three migrant Africans domiciled in South Africa were coldly murdered by their fellow African brothers. And the only crime of these brothers and sisters is that fate has been cruel enough to catapult them to South Africa for one reason or the other. And they are now vulnerable and at the mercy of aborigines who take up arms against them any day, after conveniently branding migrants as job snatchers, criminals and rapists. It becomes enough reason to apply jungle justice by brutally and savagely terminating the lives of people. I ask, is South Africa not a democratic country governed by laws anymore? The hatred and intolerance for other Africans resident in South Africa for whatever reason or through whatever means is becoming too wild for comfort. I feel it is a slap on the face and spirit of Africanism. And I am prodded to say, the South African Government is yet to act decisively on the masterminds and executors of the crises. It is the sole reason it has festered to this day. My heart was really broken when I read accounts of previous crises and realized even traditional rulers were fingered in some of these shameful incidents as instigating the youths. I cannot call it madness or demonic influence; but I am sure, by these wicked acts, South Africans have stripped naked in his grave, the Pan-Africanist and one of the world’s most venerated leaders from Africa, Nelson Rolihlahla Mandela fondly known as Madiba. We have reached a climax in the xenophobia conundrum, South Africans and its leaders must be told the simple truth. I know, no one enjoys violence and the cost of violence is felt on either side of the divide. I am truly crest fallen about the scores of other Africans killed in South Africa since 1994 when the xenophobia syndrome became a celebrated virtue among South Africa’s rural folks. Both the aggressors and victims have borne the brunt. I am particularly depressed that the mindset of the xenophobia activists led to the mistaken assassination of the South African born, world reggae legend and Rastafarian, popularly known as Lucky Dube at KwaThema Township in Johannesburg, a suburb of Rosettenville on October 18, 2007. We should cover our faces in shame at the gruesome murder of a musical genius to what Police investigation later revealed, Dube, who was cruising in his Chrysler 300C, which the assailants/car-jackers could not recognize, mistook him for a Nigerian and rained bullets on him. It’s one of the costliest prices we have paid for promoting xenophobia. Mandela was a true African; a great liberator of the masses and the oppressed anywhere on earth. But this generation of South Africans has blighted these legacies; they have embarked on a voyage which is strange and antithetical to the dreams and aspirations of what Mandela lived and died for. Today, we are violently chased out of South Africa or killed in cold blood by our own African brothers in this country. It is agonizing that South Africans should ignore the roles African and world leaders played for the dismantling of apartheid in the country. As Nigerians, we contributed immensely and steadfastly and by every means at various times to assist our brethren in South Africa break the manacles of apartheid, which was their darkest era in history. Nigeria, like other African nations, identified, empathized and stood firmly behind them during their most tormenting moments in offering a plank for the black majority South Africans to overcome their travails. Nigerians did this for a reason and a conviction. We don’t share any biological paternity with South Africans. But we believed in the African spirit and blood as members of the African Union (AU). We were inspired by the struggles to fortify the future of Africa against oppression, discrimination and suppression. We were bonded by the visionary leadership provided by Madiba, not only for South Africans, but the whole of Africa and the world. We went through the nightmare because we assumed assisting to liberate our brothers meant the liberation of Africa and the evolution of a continent where every African would live in peace, love, harmony and fraternity with other people irrespective of race. But today, I regret to say, a liberated, independent and democratic South Africa has betrayed Nigeria by its elevation and sustenance of xenophobia crises indoor and against other Africans in such a terrible manner. It’s a pain in the heart for the rest of us Nigerians, because I still recollect vividly that civil servants donated a percentage of their salaries and, as students we voluntarily and joyfully skipped lunch in school to be able to contribute to the “Mandela Tax” Fund to financially empower South Africans battle apartheid at its most vicious time. Nigeria actively supported the African National Congress (ANC) and the Pan Africanist Congress (PAC) with an annual subvention, from the 1960s all through to the 1970s for the struggle. And even in the post-apartheid era, Nigeria under President Olusegun Obasanjo contributed handsomely to the Southern Africa Relief Fund (SAFR). And all contributions came to black South African organizations in millions of dollars. We did it in the spirit of African brotherhood. So, South Africa cannot spit in our faces in this disgraceful manner. I have no reservation to state unambiguously that what is happening now in South Africa is a betrayal of Madiba and his cherished principles. Where are the South African leaders today? Why have they allowed this shame in the guise of xenophobia on their land to turn Africa into a laughing stock in the comity of nations? Where is the spirit of Africanness? Any further delay in taming this monster would be dangerous and South African leaders must openly condemn this nefarious act and come clean and clear. Thus, far, I commend the South African President Cyril Ramaphosa’s boldness in openly condemning the latest xenophobia killings in KwaZulu-Natal province. I am elated about his vow to descend very hard on anyone fingered in the recent attacks on foreigners, leading to the death of three persons. I urge the President to migrate from rhetorics to real action against perpetrators to serve as deterrence. Our brothers in South Africa must reflect on the laments and wise counsel of the C-in-C of the Economic Freedom Fighters (EFF) Mr. Julius Malema on the latest xenophobia crisis; “Our people are tempted to believe, the simplest solution is that if you drive away the foreigners, we will work tomorrow. But the fact is that there are no jobs and even if these people leave, there will be no work to do.” We are Africans and we must learn to tolerate one another and live together in unity to overcome the adversaries of Africa. Agbese is a publisher and researcher in human rights laws based in the United Kingdom.